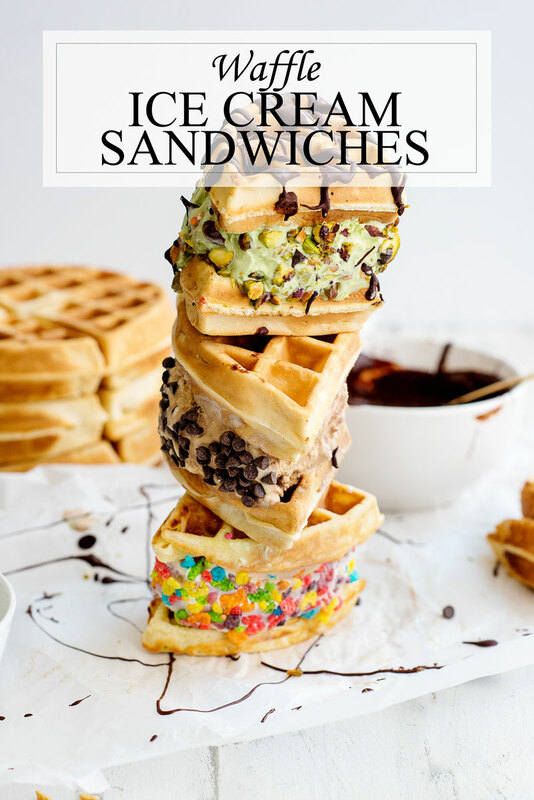 These Homemade Waffle Ice Cream Sandwiches Recipe are the perfect summer treat! This halfway homemade version is so easy and totally Instagrammable. 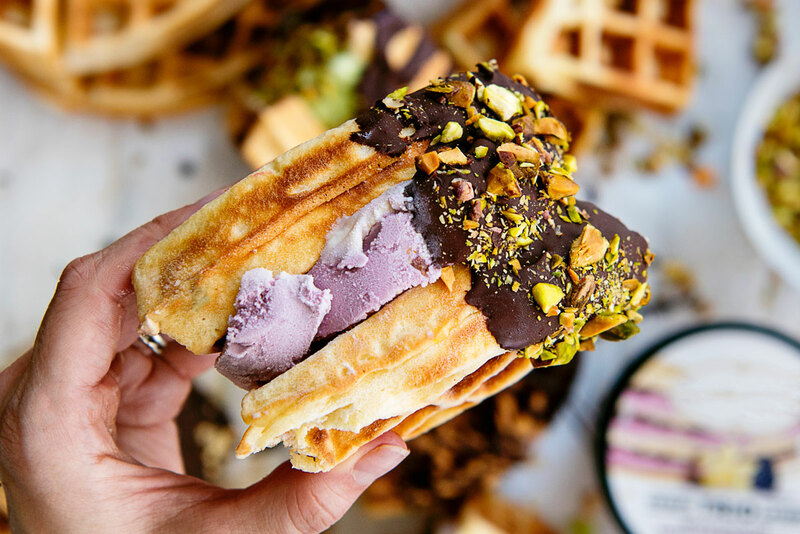 When I think about these waffle ice cream sandwiches, all sorts of annoying made up foodie words come to mind like NOMTASTIC and FOODGASM. 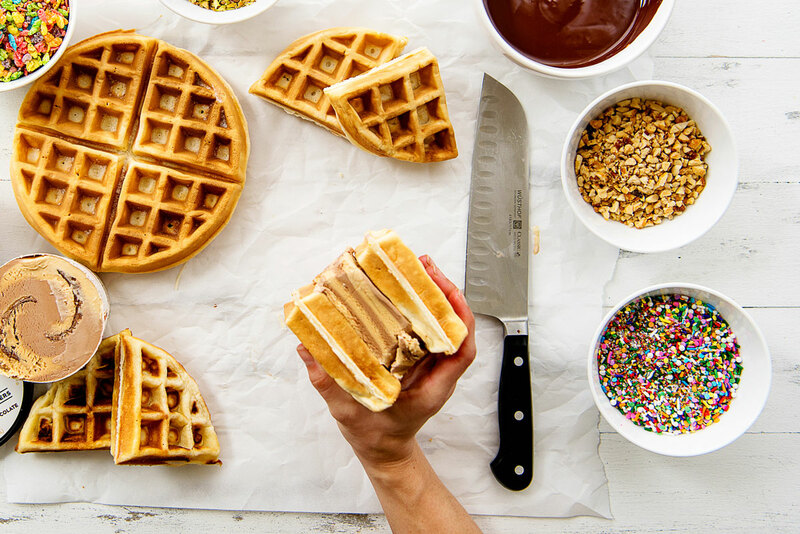 Read on for the waffle ice cream sandwich recipe with step-by-step photo instructions! 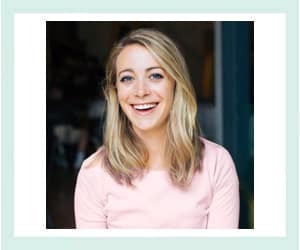 Maybe instead of annoying words we should just focus on the above photo. I don’t really think I need to say more. Always trying to eat a balanced diet. ⚖️ @tensewatches make sure I’m not late to my next foodie adventure. Their handmade watches are made from reclaimed wood making them not only beautiful but eco-friendly! 🙌🏻 This one is the Hudson with a Walnut face and Mint leather strap. 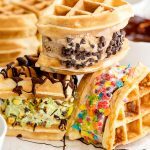 These ice cream sandwich waffles first made an appearance on my Instagram account this week. I asked on Instagram stories if you wanted the recipe and I was blown away with the response. The answer was a resounding YES. So here we are – I aim to please! 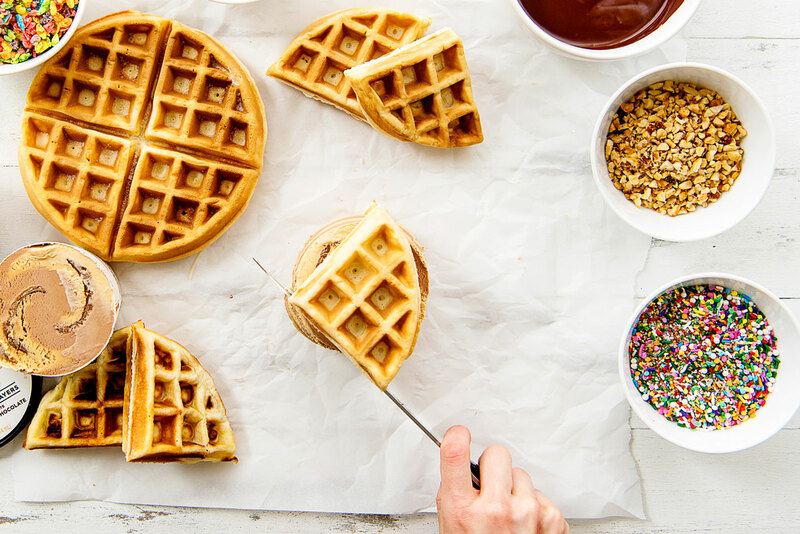 You can use store-bought or homemade waffles for this recipe. I found that homemade waffles work best if you freeze them for at least an hour before using them. This slows the melting of the ice cream. Store bought pints of ice cream are perfect for this recipe. Just use a very sharp knife to slice the ice cream while it’s still in the carton. 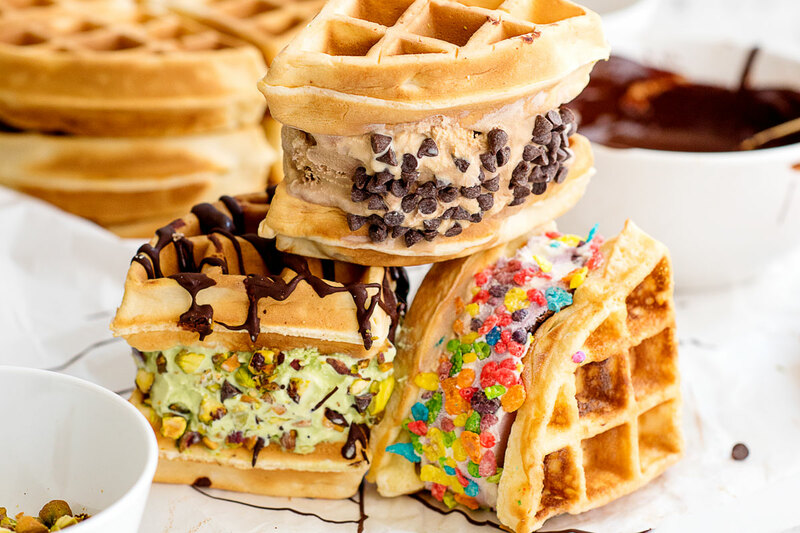 With the ice cream still wrapped, place it on a waffle triangle. Gently lift off the paper. Press another waffle triangle firmly down on top of the ice cream. Use the knife to trim off any overhanging ice cream. 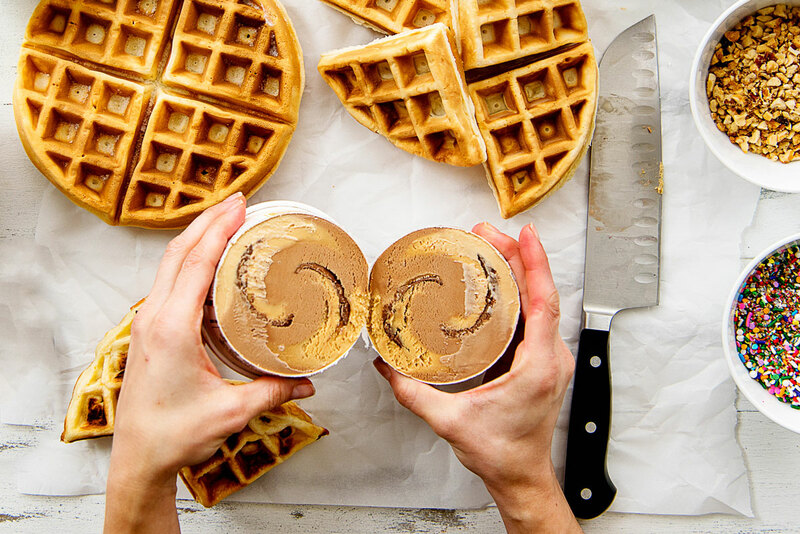 You can also use the flat part of the knife to press the ice cream into the shape of the waffle. We’re not done yet though! Now it’s time to dip them in chocolate, drizzle them, sprinkle them and top them with whatever your heart desires. 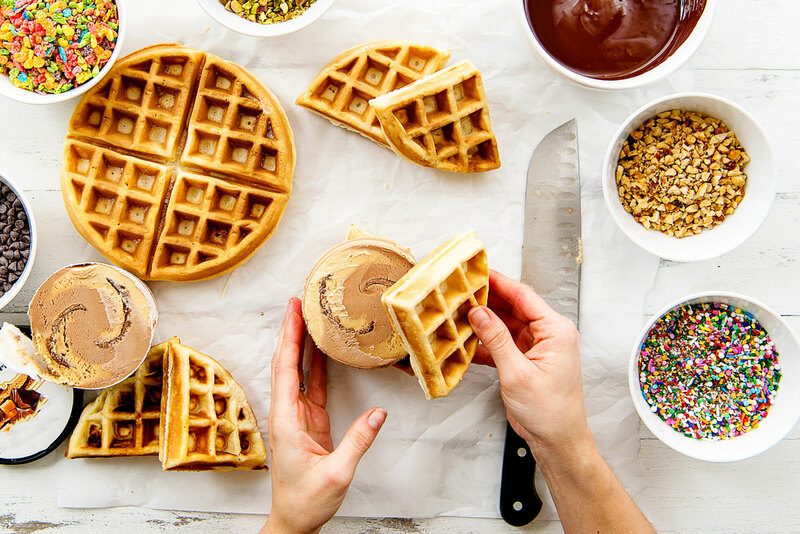 Using store-bought ice cream and waffles, you can make these in minutes. 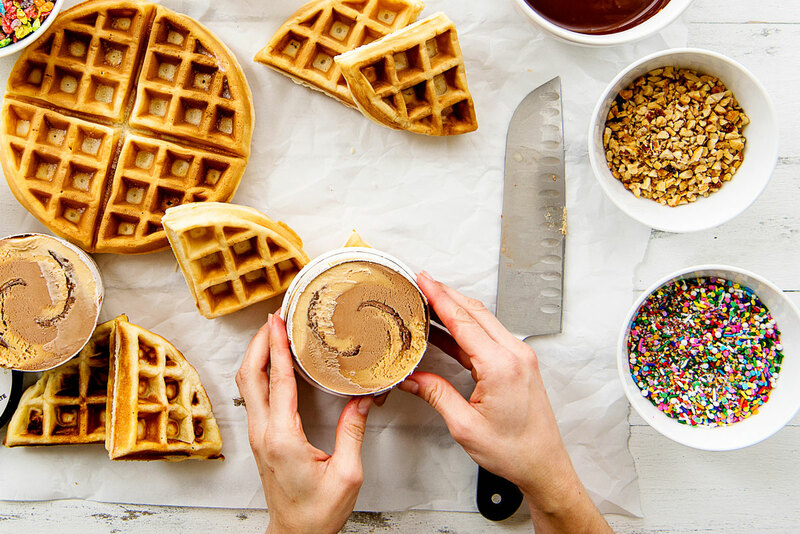 For a fancier version, use homemade Belgian waffles. This fun summer treat appeals to kids and adults alike. 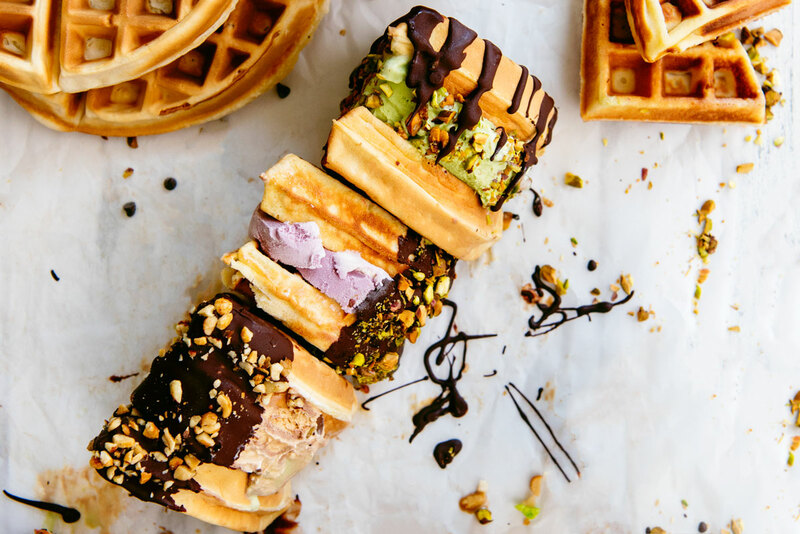 Have an ice cream bar where people can make their own as a fun party activity. Can you say photogenic? 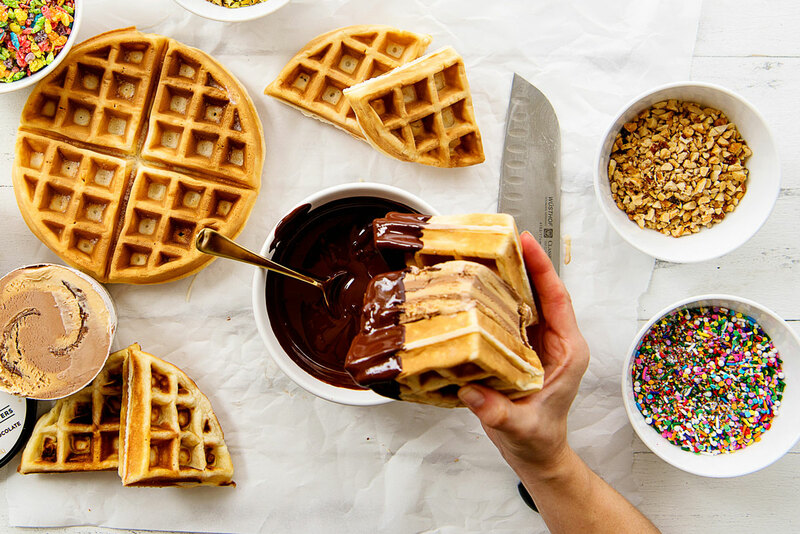 These are basically the most Instagrammable food ever! 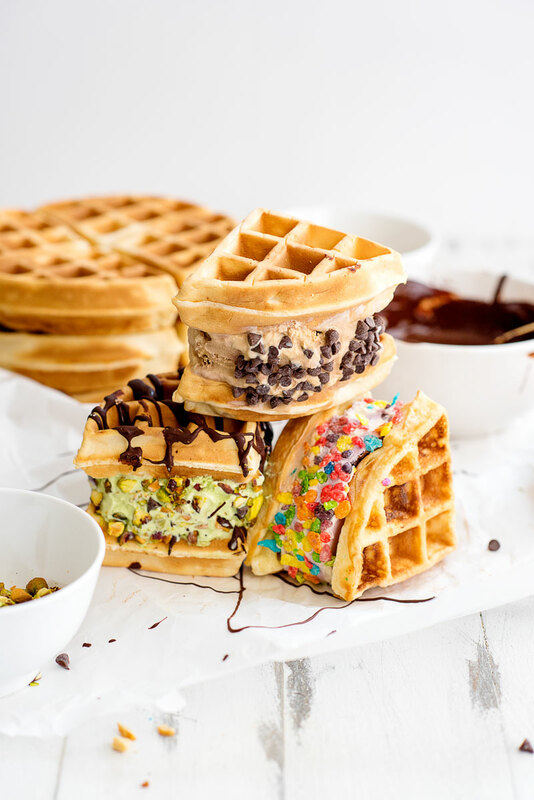 Cut each frozen waffle into four sections. Use a very sharp knife to carefully slice the carton of ice cream into three sections crosswise. 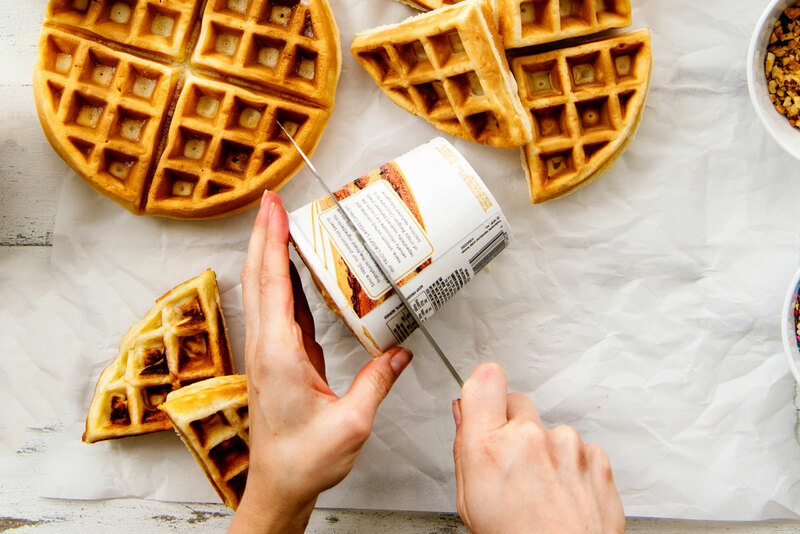 Press a second waffle triangle firmly down on top of the ice cream. 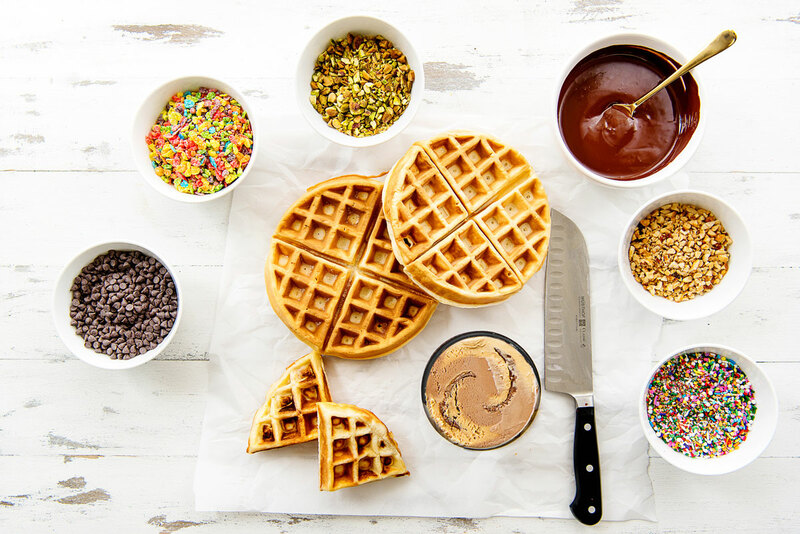 Decorate as you wish – dip waffles in melted chocolate, drizzle them with chocolate, add sprinkles, add toppings and whatever your heart desires. Eat immediately or freeze for up to 24 hours in an airtight container prior to enjoying. 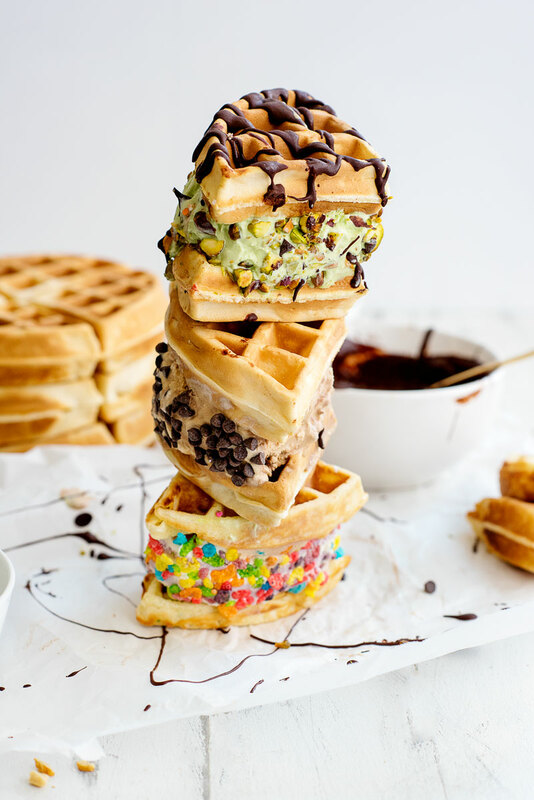 * I’ve found that freezing the waffles before adding ice cream makes them easier to work with and keeps the ice cream from melting too quickly. 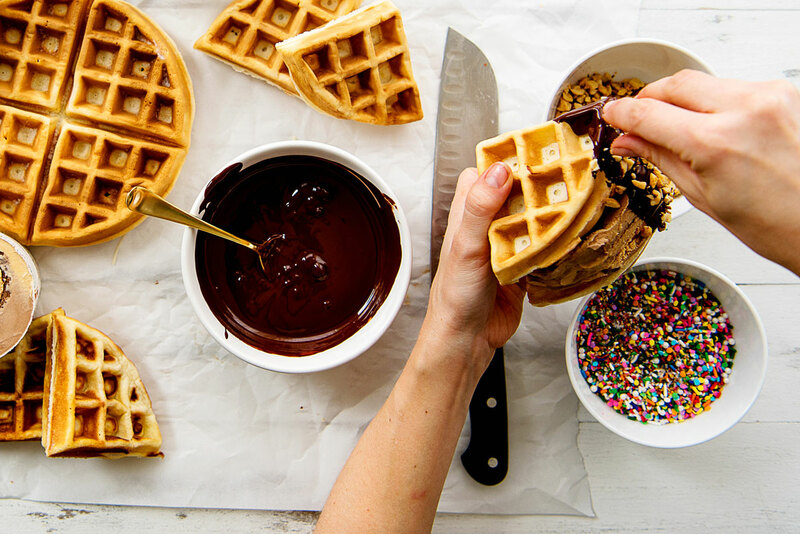 You can use store-bought or homemade waffles. 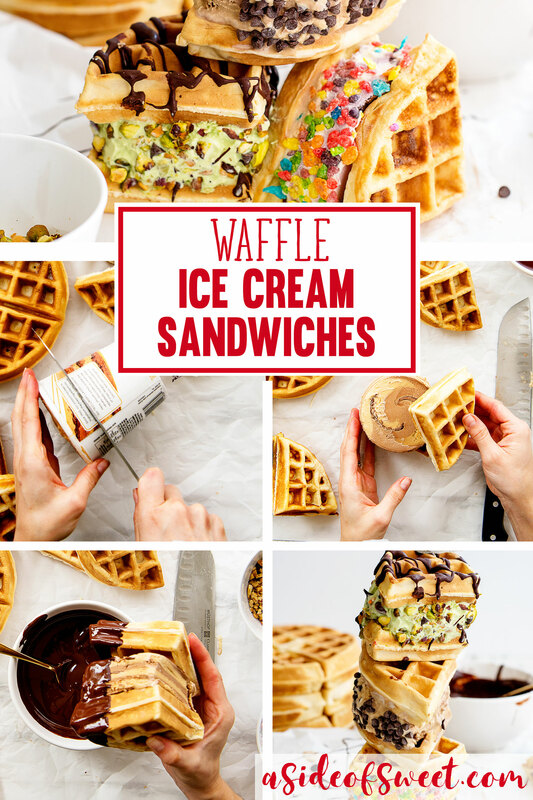 Craving Waffle Ice Cream Sandwiches? Pin this recipe for later! I promise they are! Thanks for stopping by!